There you are, just driving along in your 1987 Buick LeSabre, when, POP! your 1987 Buick LeSabre breaks or is broken in its engine under the hoodblock. You can tell it’s broken because it has stopped moving forward and is sitting still. What do you do? You could take it to a mechanic for 1987 Buick LeSabres, but that kind of specialty work is expensive. And how are you going to get it there? Your car is broken, and nothing is big enough to transport an entire car. Cars aren’t that hard to fix anyway as long as you know what you’re doing. With this guide you can know what you’re doing when you repair your car which is a 1987 Buick LeSabre. Listen to your car. The sound it makes will indicate what the problem is. If it’s a tink-tink sound, it’s the radiator. A clonk-clonk means it’s the catalytic converter. Thump-thumping is likely something in the belts or the wheels. A lack of sound means your radio is broken. Diagnose the problem. Tell yourself this is definitely the problem with your car and do not listen to what anyone else says. Go to a local auto repair shop and buy a guide labeled “Haynes 1987 Buick LeSabre Repair Manual.” This may help you. Find your tools. Look in your toolbox for your car tools. The toolbox will be in your garage where you car is kept. 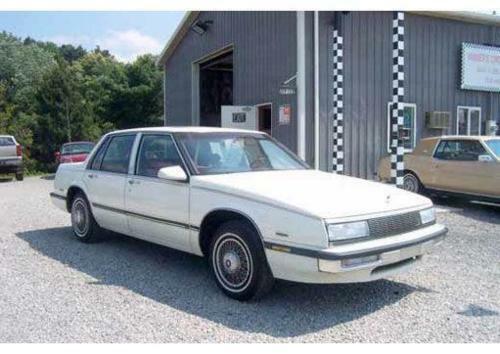 Fix the 1987 Buick LeSabre. You can do this by using the tools on the problem. Start the car. If you fixed it correctly, it should run normally. Drive your car. Drive it by the local 1987 Buick LeSabre repair shop and laugh at how you were able to do what they could not. The car should keep running for another 24 years with no problems. Car repair invariably involves you getting oil all over yourself. The best way to deal with this is to wear oil-colored clothes so the stains blend right in. Sounds are the most important indicators of a problem with a car, but smells can be useful too. For instance, if your car’s exhaust smells like pizza, there is a pizza in the tailpipe. Occasionally your 1987 Buick LeSabre cannot be repaired. In that case, you must go buy a new 1987 Buick LeSabre.